Phineas Divol Jr married Harriet Ann Gilson in 1840. Phineas Divol Jr married Hannah Evans. Judith Divol married Ivery Damon in Aug 29, 1832. Harriet Ann Gilson married Phineas Divol Jr, son of Phineas Divol Jr and Esther Houghton, in 1840. Ivery Damon married Judith Divol, daughter of Phineas Divol Jr and Esther Houghton, in Aug 29, 1832. Achsah Houghton married Ephraim Barber in Dec 28, 1803 at Berlin, Worcester Co., MA, USA, MLM: Dec. 29, 1803. Eunice Houghton married Silas Carrouth in Oct 12, 1807 at Northboro, MA, USA. 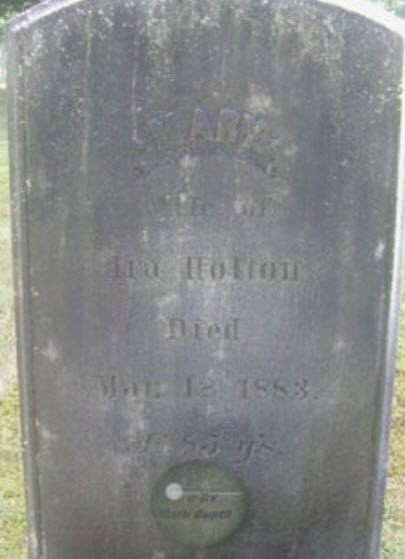 Death Aug 7, 1823 Berlin, Worcester Co., MA, USA, JWH & BT: 1825; Berlin VR: a. 42 y. 10 m.
Caleb Houghton and Abigail Meriam declared their intentions of marriage on Jan 2, 1819 Lancaster, Worcester Co., MA, USA. Caleb Houghton married Abigail Meriam in Jan 2, 1819 at Berlin, Worcester Co., MA, USA, MLM: Jan. 20; Weis: Jan. 19. Death Oct 2, 1838 Berlin, Worcester Co., MA, USA, a. 46 y.
Jonah Houghton and Zilper Howe declared their intentions of marriage on Oct 11, 1817 Berlin, Worcester Co., MA, USA. Jonah Houghton married Zilper Howe in Nov 19, 1817 at Boylston, Worcester Co., MA, USA. Ephraim Barber married Achsah Houghton, daughter of Deacon Cyrus Houghton Jr and Experience Pike, in Dec 28, 1803 at Berlin, Worcester Co., MA, USA, MLM: Dec. 29, 1803. Peltiah Gibbs married Achsah Houghton, daughter of Deacon Cyrus Houghton Jr and Experience Pike, h/2. Silas Carrouth married Eunice Houghton, daughter of Deacon Cyrus Houghton Jr and Experience Pike, in Oct 12, 1807 at Northboro, MA, USA. Death Aug 30, 1818 Berlin, Worcester Co., MA, USA, BT: Sterling; JWH: 23 Aug 1818; Berling VR: Aug 30 and Aug 20, a. 37 y and 36 y. 10 m.
Lucy Ann Conant and Levi Houghton declared their intentions of marriage on Nov 7, 1848 Lowell, Middlesex Co., MA, USA. Lucy Ann Conant and Levi Houghton declared their intentions of marriage on Nov 12, 1848 Berlin, Worcester Co., MA, USA. 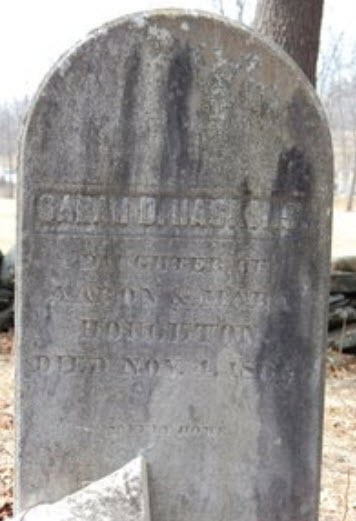 Lucy Ann Conant married Levi Houghton, son of Silas Houghton and Lucy Farnsworth, in Jan 1, 1849 at Lancaster, Worcester Co., MA, USA, Levi, 36; Lucy, 32. Death Apr 3, 1880 Berlin, Worcester Co., MA, USA, a. 81 y.
Zilper Howe and Jonah Houghton declared their intentions of marriage on Oct 11, 1817 Berlin, Worcester Co., MA, USA. Zilper Howe married Jonah Houghton, son of Deacon Cyrus Houghton Jr and Mary Taylor, in Nov 19, 1817 at Boylston, Worcester Co., MA, USA. Oliver Houghton married Lois Whitney in Sep 18, 1793 at Acton, Middlesex Co., MA, USA. Lois Whitney married Robert Coolidge in Nov 10, 1779 at Stow, MA, USA. Lois Whitney married Oliver Houghton, son of Joseph Houghton and Ame Haskell, in Sep 18, 1793 at Acton, Middlesex Co., MA, USA. Charles Stewart Houghton married Hannah Perry in Jan 2, 1820 at Putney, Windham Co., VT, USA, p. 412 of town records. 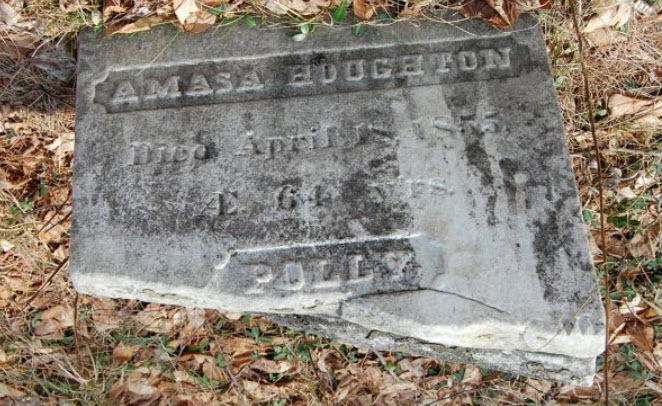 Amasa Houghton married Polly Haven, daughter of Joseph Child Haven and Pamela Houghton, in Oct 31, 1812 at Dummerston, Windham Co., VT, USA, Putney VR: Polly; JWH: Dolly Haven; VT Gazetteer Index: Polly, v. pt. 2, 33. William S. Houghton married Sally Sawtell, daughter of Levi Sawtell and Dolly Whitney, in Aug 20, 1824. William S. Houghton married Elizabeth Gray Wilkinson in Oct 2, 1833 at Townshend, VT, USA, DAR: Eliza Gray; Putney VR: William and Elizabeth, 1st m; JWH: 10,2, 1838. Thomas Houghton married Betsey Parker in Oct 29, 1817 at Putney, Windham Co., VT, USA. Mary Houghton married Ira Holton, son of Arad Holton and Rebecca Houghton, in Feb 5, 1824 at Putney, Windham Co., VT, USA. Sarah D. Houghton married Freeman Haskins in Dec 4, 1845 at Putney, Windham Co., VT, USA. Fanny Houghton married Aquila Jewett. Hannah Perry married Charles Stewart Houghton, son of Aaron Houghton and Mary Houghton, in Jan 2, 1820 at Putney, Windham Co., VT, USA, p. 412 of town records. Polly Haven married Amasa Houghton, son of Aaron Houghton and Mary Houghton, in Oct 31, 1812 at Dummerston, Windham Co., VT, USA, Putney VR: Polly; JWH: Dolly Haven; VT Gazetteer Index: Polly, v. pt. 2, 33.